Young singer Maryam Saleh, 28, represents a musical movement that raged in the aftermath of the January 25 revolution, one that is often dubbed independent, or underground, music. Saleh, alongside contemporaries of the same music scene, indeed wandered off the traditional realm of musical performance. Raised artistically by her father, the late playwright Saleh Saad, she started singing and acting at the age of seven. She then trained and worked with a number of theatre and music troupes, most prominent of which were El-Warsha, Tamy, Habayebna, and Baraka, which she founded. She also starred in Ibrahim Battout's film Ein Al-Shams (Eye of the Sun) and played a role in a television series dubbed Farah Laila (Laila's Wedding) with actress Laila Elwy. Her first album was labelled Ana Mish Baghanni (I Don't Sing) -- an apt explanation of the type of music that she presents, which may be described as actually being opposed to singing. The style clearly embraces singing out of tune, or rebelling against the manners of traditional Eastern music, and adopting instead a blend of pop and protest music mostly based on poetic texts that are closely related to the current Egyptian moment without being blatantly political. The lyrics of her songs -- which were written by significant young writers such as Mostafa Ibrahim, Mido Zoheir and Omar Mostafa -- are responsible for the production of this new musical discourse. Born out of the revolution, they are immersed in the details of its ups and downs and attentive to the personal domain -- which had become absent in mainstream songs restricted instead to sensationalised singing and caught in the ridiculously redundant binary of coming together and abandonment. Furthermore, young audiences react remarkably well to Saleh's stage performances at independent spaces. The phenomenon begs contemplation, since her style and song lyrics are a topic of sarcasm on Facebook pages such as "Asa7be", which nevertheless perpetuates her presence as an icon. She now even features as the star of several street murals in the city. This interest is perhaps the result of Saleh's primary focus on expression. She prefers the performative ingredient over traditional musical elements, or rather, abandons the latter altogether, as reflected in her songs Ana Mesh Baghanni (I Don't Sing), Watan El-Akk (Homeland of Chaos), which she composed, Eslahat (Reforms) and Robaeyat Shagar El-Tout: Donya w-Kedb (Quartets of Berry Trees: World and Lies). In these songs, she is more of an actress performing a melodrama, revealing a mix of conflicting emotions, performed in a way that disillusions recipients. In some of her songs, Maryam Saleh reminds us of caricaturist performances, which brings her closer to the monologues that spread through Egyptian music until the 1960s and waned with the departure of its icons, Ismail Yassin and Shokouko -- whose songs she covered, including "Helw El-Helw" (The Beautiful One). Yet she does not confine herself to social satire, as is typical of this genre, delving instead into the political realm, as evidenced in her songs Watan El-Akk (Homeland of Chaos) and Sor'et El-Ayam (The Speed of Days). She also covers songs by Sheikh Imam -- including "Nixon Baba" and "Valéry Giscard d'Estaing" -- in special repertoires that she fully dedicates to the revolution's composer and principal representative. Experience gained by working with El-Warsha and Tamy troupes, as well as the Choir Project, has helped fortify her performance with dramatic and satirical images which emphasise her performative character in a way reminiscent of what the late Yehia Haqqi would call "the cartoonish trait in the songs of Sayed Darwish" – a trait skilfully developed by Saleh, as seen in her contemporary adaptations of Imam's songs, and particularly in her modern compositions co-produced with Tamer Abu Ghazala and Zeid Hamdan. 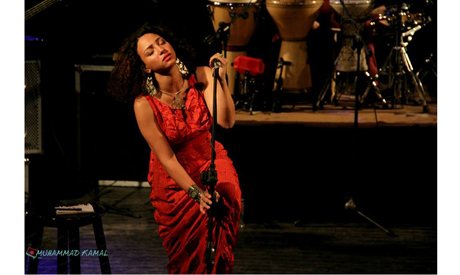 Despite the reservations that permeate Egypt's music scene regarding Maryam Saleh's performance style, her audiences quickly become engaged by it, particularly when she delivers songs that come closer to the repertoire of traditional Egyptian music. With songs such as Emshi ala Remshi (Walk on my Eyelash) and Tool El-Tareeq (All the Way Through), she emerges as a musician who respects musical norms; with others, such as Wahdy (Alone) -- in which a state of existential crisis intermixes with deep wounds -- she delves into uncharted territories and untraditional practices. The song, resembling the wails of anxiety, lays bare personal pain, focusing a spotlight on this singer who creates engaging music out of dissonance.